1. Cut data into 1.5″ pieces and wash it. 2. Cut pumpkin like the picture and wash it. 3. Heat the pan with oil and add the onion. 4. Cook the onion till it becomes transparent. 5. Add bay leaf, turmeric, chilli, onion paste and salt and cook it till oil comes out. 6. Add prawn and cook 2 minutes. 7. Add data, pumpkin and 2 cups water and cook it till data becomes tender. 8. Add cumin powder and check the salt. Remove from the stove. 9. 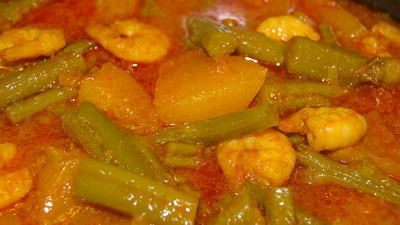 Serve data chingri with rice. I am big fan of your website. I live in Melbourne Australia. Could you please tell me where can I (recipe data Chingri)get data? What’s the English name of data? You have NO IDEA how long I have been looking for this one. Thanks a lot. Most welcome. Your words are my inspiration. So never shy to share it. hi i live in usa .Love your blog .My friends are so curious to find out where i am getting my receipes from .All credit goes to you. Today ,I need your help to find out about different kinds of shak.There are different kind of Sak (green leaves) available in Asian farmers market here ,but i don,t know which one is what.Can you give me the english name with bengali name of that sak .I only know when i see pui sak and lal sak. Thanks. I will try to do post on bangladeshi leafy vege(shak) with name and photo soon. May be it will help. Thanks for continued sending mother test receipes. Thats the reason behind my cooking(missing mum’s cook badly). So only option I have to cook like her, After all I know the taste. Thanks.